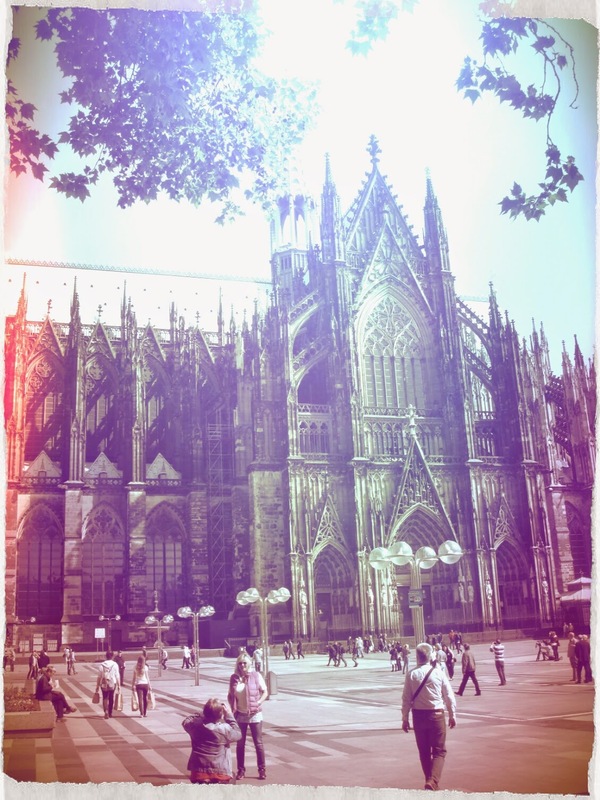 Even if I had never been there, Cologne belongs to my childhood. During those years Cologne was for me a snowglobe with the cathedral and several wooden toys coming from a shop that no longer exists. 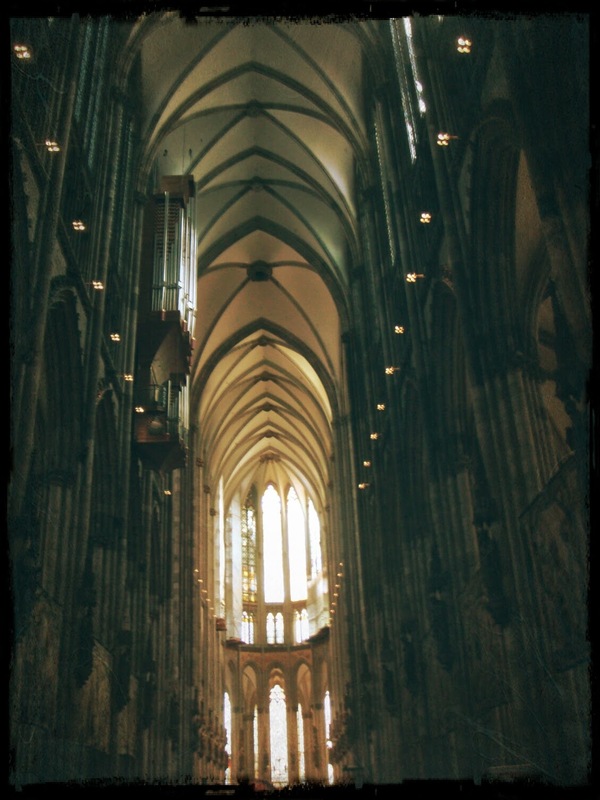 Cologne has been one of the first and most frequent work travels of my dad - and, at 8, I used to kinda boast about it, about the fact that my father was going to Germany for work. It was something somehow special, even if then I was missing him. And then I remember that, when he was coming back home after some days away, it was almost a kind of celebration; and I also remember the small plastic bags containing butter sandwiches and gummy bears that Lufthansa used to give to the travellers in the waiting room. The '80s used to be another era for airlines. Since he's retired, almost 7 years ago, he's been kept on telling that he wanted to take us to see this Rheinan city that, to my mum & me, was almost like a sort of mythological tale - and to him some kind of travel along the memory lane. So, last Sunday, for his 64th birthday, the promise has come true. 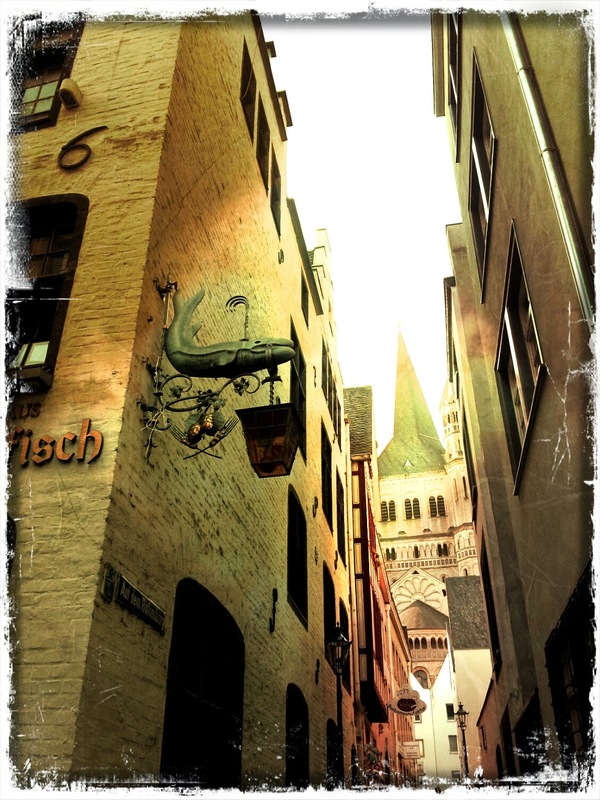 Cologne is a city that has almost got completely destroyed after WWII, so nowadays it's mostly modern, with that kind of austere and boring buildings from the '60s, but, here and there, in the Altstadt, there are still some narrow alleys, where the light is shadowed and makes you feel a bit of nostalgia of the past, among the colourful trellis houses, the swinging signs in front of the pubs and the stone fountains. 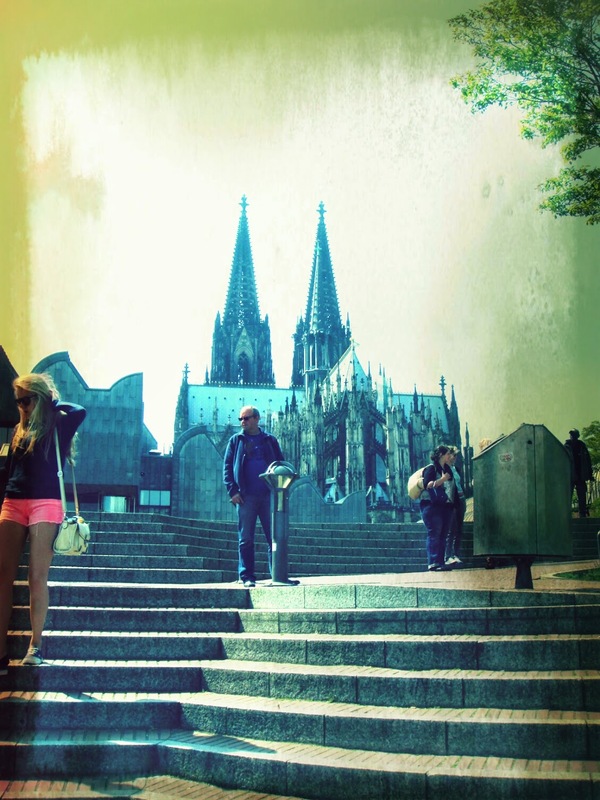 Cologne has a very long and important history, that dates back to Ancient Rome. The first Roman settlement that has been built here gave birth to Agrippina, Nero's mother, and since then it had been called Colonia Agrippina. There is still a perfectly preserved Roman route, with its unsquared basalt pieces: it's situated next to the Diocesan Museum, and leads to the two other most important museums of the city, the Roman-Germanic one, built around a beautiful mosaic found after some after-war restorings, and the Ludwig, which owns one of the most important collection of Picasso in Europe. The walls date back to the Romanic era as well. There are still some ruins here and there, and their perimeter can be gathered watching the city's planimetry. 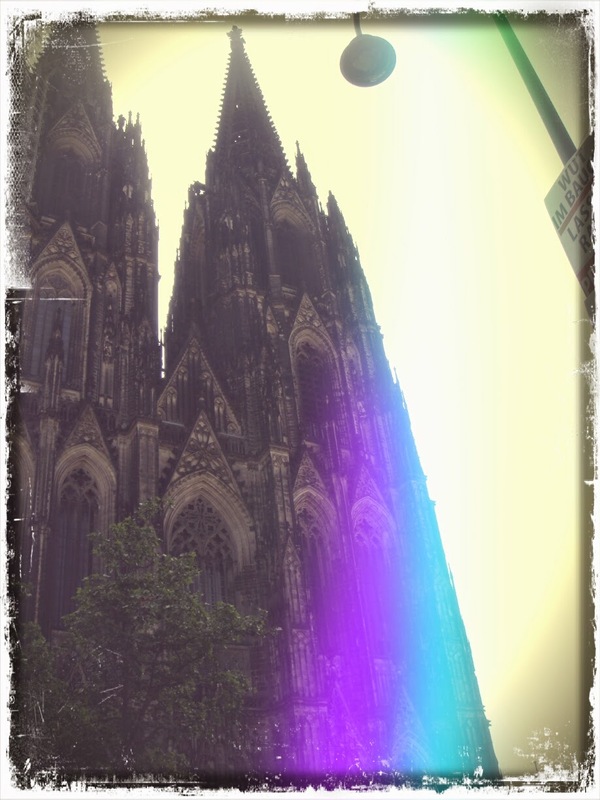 But Cologne is essentially its Cathedral. The Cathedral is the symbol of this city, it's first thing ever that you see coming out from the railway station and its dark shape, tall and imponent, dominates the skyline from any point of view. It's a wonderful gothic nightmare that leaves you breathless - enormous, gloomy, dramatic. It spires so high, almost as if it desperately wanted to grab the sky, almost as if it was running after it and was scared of losing it... but it still stays grounded on the floor, to the misfortunes and the shadows of the world. It's not just a cathedral, it's almost a metaphor of the torment of the human soul, of its dark sides and its grandiosity. As a kid I used to get enchanted to contemplate a miniature of it, closed inside a snowglobe; now I can contemplate it live, almost crushed by the disturbing beauty of this gothic meteorite that almost looks like fallen from the sky, or maybe emerged from the underground - but it actually has been generated by the complexity of human mind, by the sacrifice which has lasted for centuries of those who have brought one by one all the stones used to build it. The platform on which the Cathedral rises is a meeting point, and it maybe is since centuries. People come over to watch street artists' performances, boys speed on their skateboards, some guys wearing Lord of the Rings t-shirts, already quite tipsy on a Saturday afternoon, get their trousers soaked by trying to ford the fountains, pretending to be Hobbits in the Moria's marshes. The platform hides what once was a hill, already consacrated back to the times of the Romans, on which was rising a temple dedicated to Mercury. City marketing from the Middle Ages was based upon the presence on place of important relics, which were bringing a huge traffic of pilgrims and rich gifts, so one day a Cologne bishop brought here those that have been officially presented as the remains of the three Kings - so in 1248 they started building an incredible and imponent cathedral, suitable for hosting them. And no other cathedral better than this one becomes an extreme example of the gothic architectural style, of its audacity: with its 157 mt of height, it's a huge but very delicate weaving of pinnacles and decorations. 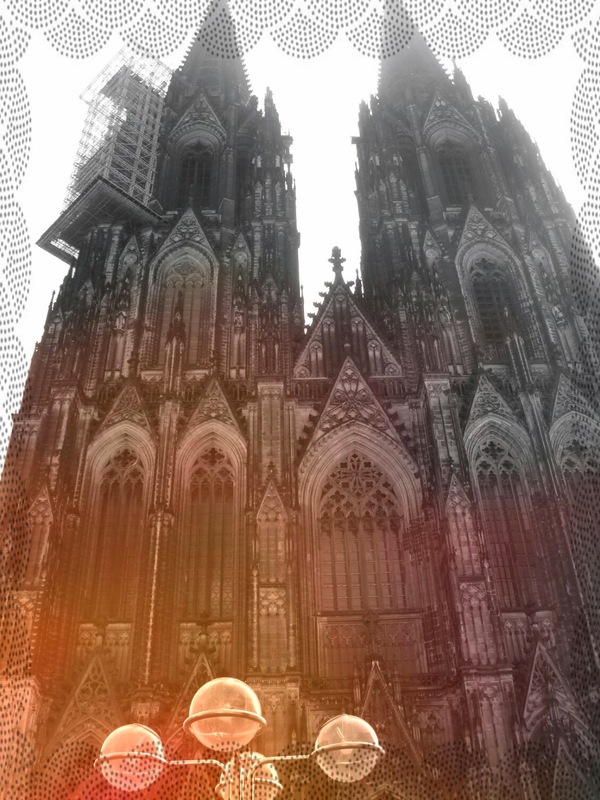 The gates of the southern portal have been created just in 1948, and chronichles tell about the impressive procession of saints' statues coming from different churches in Cologne, being transported towards the Cathedral, towards the heart of city destroyed by bombs, as if they were a message of hope, of will to rebuild the city and make it rise again. Inside it you will obviously find the coffer containing the Kings relics, shining and rich, completely made of gold and decorated with precious stones - which have been regularly stolen through the years. But the Cathedral is not only made of stone, it's also made of glass: there are 10.000 mq of glass windows, belonging to different epoques - a rich collage of colors and stories. The most recent ones date back to 1848 and are a gift from king Ludwig of Bavaria. Well, I would go on forever to contemplate (and talk about) the Cathedral, but you just have to get out of it sooner or later, and a stop at the historical pub Früh is almost a must, just like it is a must to taste the typical Cologne beer, the Kölsch, sweet and light, served in long, round and short glasses - very far away from the huge portions offered in Bavaria. 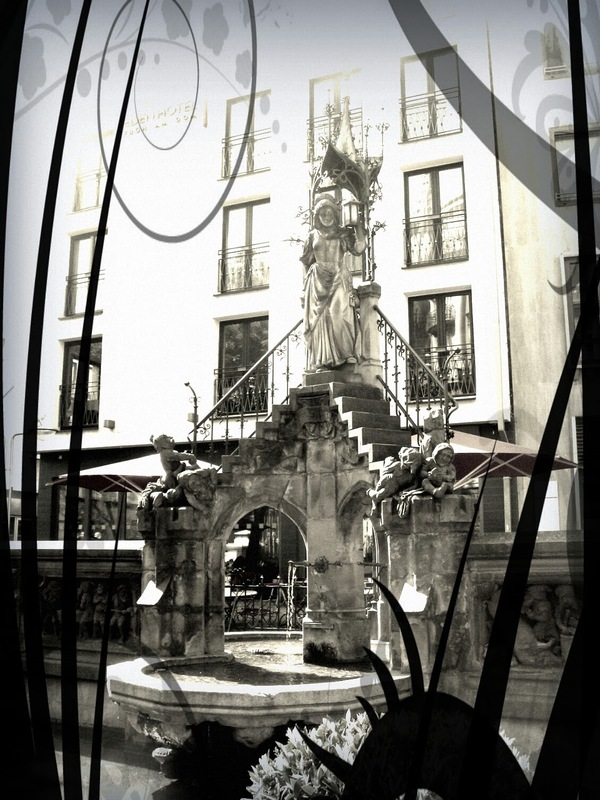 In front of the pub there is the Heinzelmännchenbrunnen fountain: they look like Snow White and the Seven Dwarves, don't they? They are some hardworking goblins who, a long time ago, had taken over the duty to do during the night all the work that the Cologne craftmen were not able to end during the day - just like that, out of generosity and sense of duty. But they were also very shy and withdrawn goblins, and, when the nosy tailor's wife decided to stay up during the night to find out why work was always getting self-completed when darkness was falling, she revealed their secrets, so they got offended and went away, obliging the poor Cologne inhabitants to scrape along by themselves. Rheingarten is the stroll that goes along the Rhein and that, with its colorful houses and small green areas, accompanies you up to the Imhoff-Stollwerck Museum, also known as Chocolate Museum. Mr Imhoff was a German enterpreneur who, besides the museum, also founded one of the most important chocolate companies in Germany, in spite of having started just like a modest baker. Nowadays, anyway, the museum's partner is Lindt, not Stollwerck anymore. 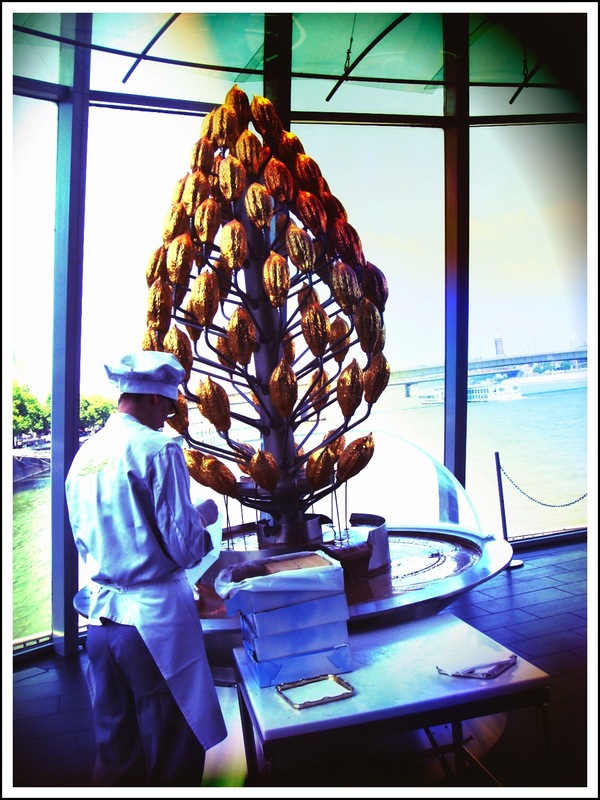 Museum starts with an interactive route that tells about the origins and the ways of harvesting and working of chocolate, from the oldest and handmade ones to the most modern and industrial. In fact you can also find the miniature reproduction of the machines used for the industrial production of chocolates - and this has been my dad's favourite part, because this kind of inustrial automation has been his job, even if the plants he used to desing were made for cars and not for chocolates. 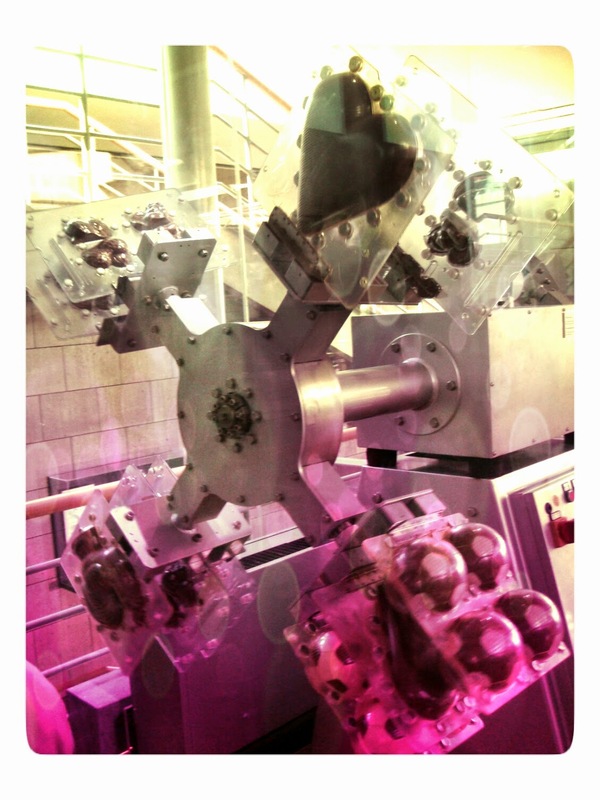 The upper floor is dedicated to the chocolate marketing, with the first automatical distributors and the history of the packagings from the main chocolate brands. 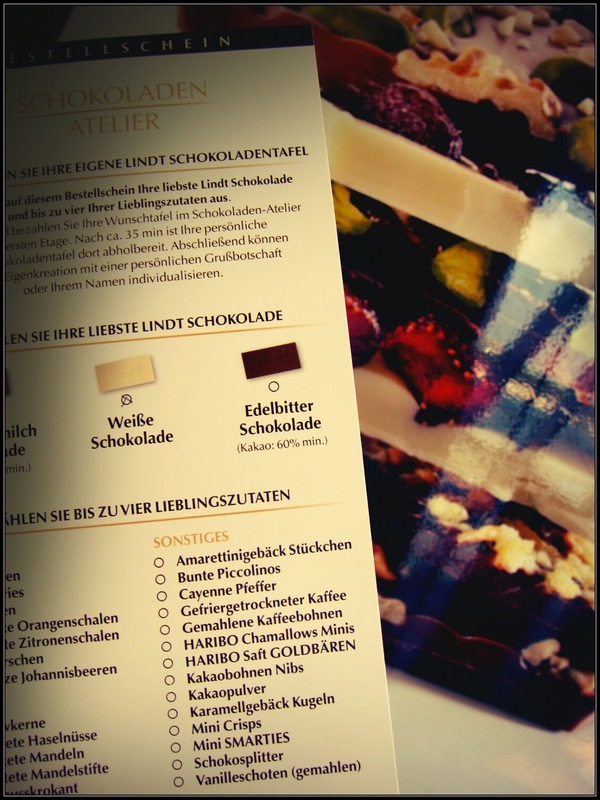 At the chocolate atelier you can have made your own personal bar, choosing the type of chocolate and the ingredients. It gets realized on the spot, in about 35'. These bars are so pretty it's almost a pity to eat them... but in order to satisfy for a moment the mouthwater generated by the awesome perfume that is in the air, there is a chocolate fountain 3 mt tall, where a confectioner dips some wafers which are then offered to the visitors. I must admit that, dippin the finger as I did in Bruxelles, is much more satisfying; but it's ok as well. And, when you go out from the museum, it's almost sunset. Sun goes down and turns the Rhein on, making it golden. 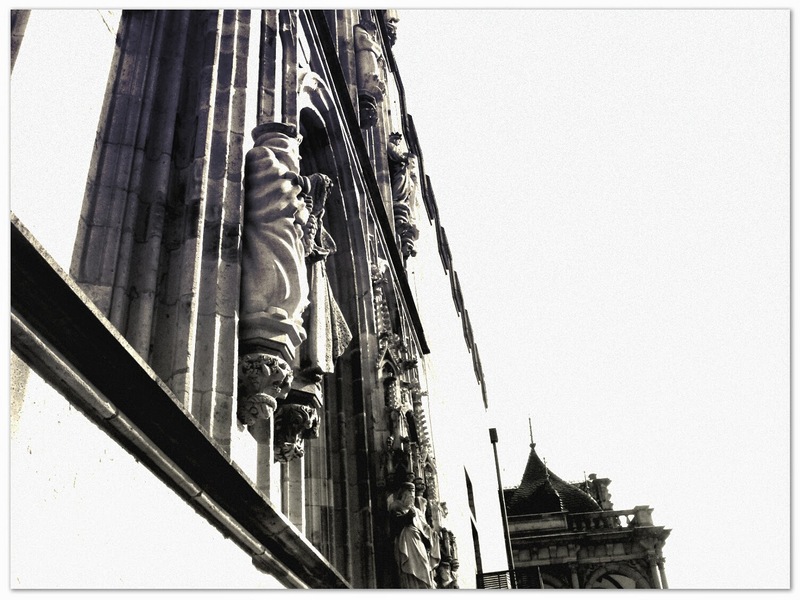 It shields the Cathedral making it almost trascendent, almost giving it the illusion to be finally closer to the sky. There are roses on the white wooden gazebos on the river. 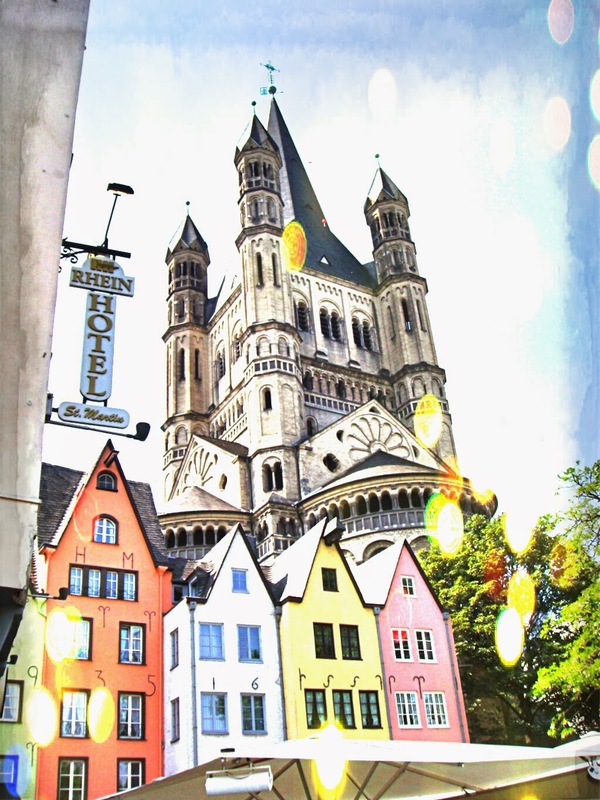 There are four pastel colour houses that frames the gothic tower of the City Hall. 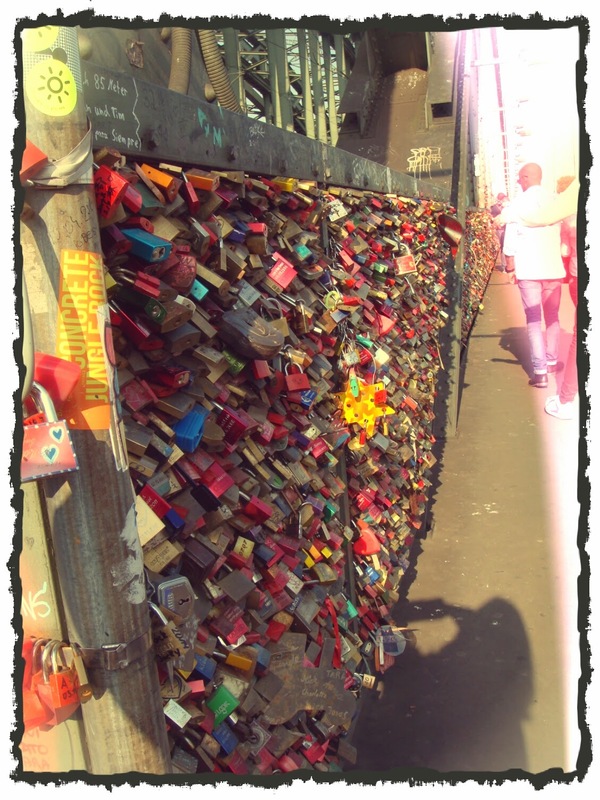 A couple hangs their lovelock to the Hohenzollernbrücke, the railway bridge. 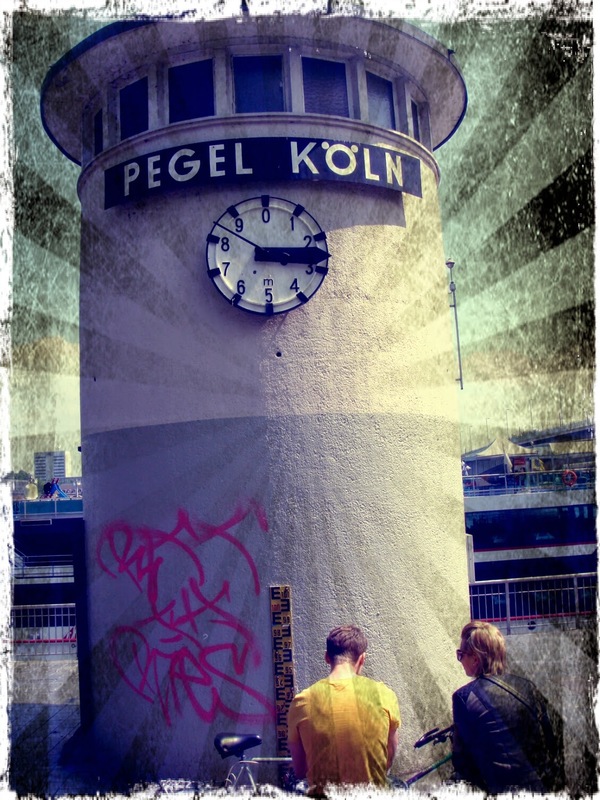 They take a picture of it and then, holding their hands, throw the key away in the Rhein. And this is the answer to my question about where the lovelocks keys were going.